I heard this quote a long time ago back in school when we spoke about France. As a matter of course I forgot about it until I came to Paris and spent my first weekend in the famous city and suddenly realized how accurate this quote is. There are so many places you can enjoy by just loafing along or you choose sitting down in a nice little café and savour watching the other people loafing around. I spent 2 weeks in December in Paris and the Christmas lightning was unforgettable, especially on the Champs-Élysées! The strollers on the 1970m long Avenue are separated from the traffic by golden shining trees. And after a long walk along all the fancy stores like Luis Vuitton, Gucci, Chanel, Hermes, et al. 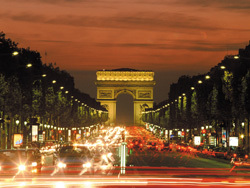 you get rewarded with an incredible view on the wonderful lighted ‘Arc de Triomphe’. Do you want to improve your French? Are you a busy professional with very little time to spare? Then look no further than Apple Languages’ new Intensive Business Course at our Paris (Louvre) School! 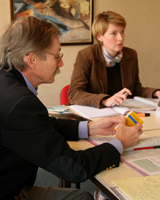 We are now offering a new Business French course aimed at executives, managers and professionals who need to improve their French in the shortest time possible. The one week course combined group and private lessons, and takes place once a month. 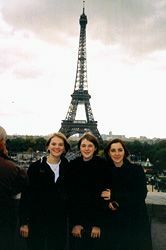 I had always known that Paris was a magnificent city, but it was only upon my arrival at the school to take French lessons that I began to understand why Paris is called “the most beautiful city in the world”! I am welcomed by a dynamic, professional and friendly team. Then now, after the presentation of our classes, here I am in the school cafeteria, which is decorated like a real Parisian bistro, chatting confidently with a teacher. After that, I greatly enjoyed myself answering a cultural quiz with all the other students. It’s a very communicative way to learn! 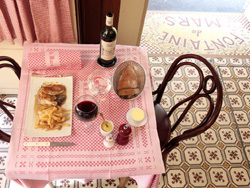 Need some tips on where to eat out during your language course in Paris? Well, Paris is just like London: there is a wide choice, with restaurants from all over the world. That’s quite normal for a capital city! But just let me tell you about what makes Paris special! I just spent the weekend there, and it’s starting to be the season for sitting outside a terrace café. 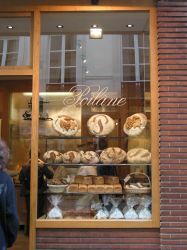 I love to go there in the morning, and have a crepe (French pancake) for breakfast. This is typically French (Breton to be accurate), but French usually love it, especially me! 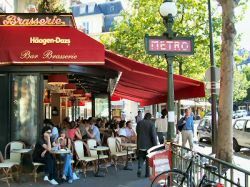 If you want to try it, there is no need to look very far, because Paris is full of terrace cafés, whether near the Eiffel Tower, Montmartre, or the Champs Elysées! The advantage of the morning is that there are not too many people, there is traffic but it’s not too noisy, and if there is bright sunshine, then it really is a must-do! They usually stay open and busy quite late, for anyone wishing a nice cold drink after seeing Paris by night. Going to Paris? Take a trip up the Eiffel Tower! 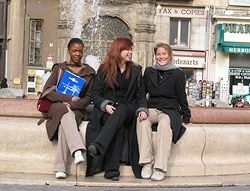 If you’re considering a French course in Paris, just listen to a Parisian born and raised! I had not gone up the Eiffel Tower since I was 6, and my goddaughter, who came to Paris for the first time during the Christmas holidays, asked me to take her. The Eiffel Tower is always popular. The day we went, although the weather was not very good (it was so windy that they had to close the top floor), there were still plenty of people queuing to catch the lifts. Even from the 2nd floor, there are breathtaking views over Paris. You can see the River Seine and the bateaux-mouches pleasure boats, Notre Dame, the Arc de Triomphe and Montmartre hill with its Basilica of Sacré Coeur.